Relevance of spring temperatures for tree-ring growth steadily increased since 1950s. Closely linked tree-ring growth and net CO 2 exchange driven by spring temperatures. 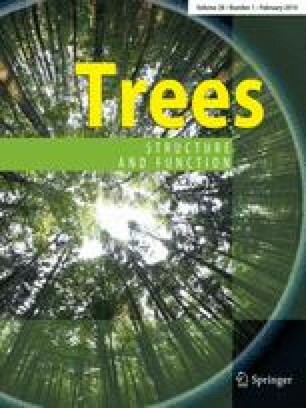 We investigated long-term (over 100 years) tree-ring width (TRW) variabilities as well as short-term (10 years) variations in net ecosystem productivity (NEP) in response to climate to assess the driving factors for stem growth of Norway spruce in a subalpine forest at Davos in Switzerland. A tree-ring width index (TRWi) chronology for the period from 1750 to 2006 was constructed and linked with climate data from 1876 to 2006, and with NEP available for the period from 1997 to 2006. Based on TRWi, we found that only two out of the 257 years exhibited extreme negative TRWi, compared to 29 years with extreme positive anomalies, observed mainly in recent decades. Annual temperature, annual precipitation, as well as autumn and winter temperature signals were well preserved in the TRWi chronology over the last 130 years. Spring temperatures became increasingly relevant for TRWi, explaining less than 1 % of the variation in TRWi for the period from 1876 to 2006, but 8 % for the period from 1950 to 2006 (p = 0.032), and even 47 % for 1997–2006 (p = 0.028). We also observed a strong positive relationship between annual TRWi and annual NEP (r = 0.661; p = 0.037), both strongly related to spring temperatures (r = 0.687 and r = 0.678 for TRWi and NEP, respectively; p = 0.028; p = 0.032). Moreover, we found strong links between monthly NEP of March and annual TRWi (r = 0.912; p = 0.0001), both related to March temperatures (r = 0.767, p = 0.010 and r = 0.724, p = 0.018, respectively). Thus, under future climate warming, we expect stem growth of these subalpine trees and also ecosystem carbon (C) sequestration to increase, as long as water does not become a limiting factor. This work was supported by a Faculty-Exchange Grant within the Scientific and Technological Cooperation Programme Switzerland-Russia. We acknowledge the use of digital long-term climate data provided by the MeteoSwiss IDAWEB data base. We thank Rudolf Häsler who started and established the eddy covariance flux measurements at Davos Seehornwald, and Magdalena Noetzli from WSL, Switzerland, for providing tree-ring measurements. Thanks also go to Roman Zweifel for very valuable comments on an early version of the manuscript. Nina Buchmann and Werner Eugster acknowledge funding within the projects GHG-Europe (EC FP7, GA No. 244122), Carbo-Extreme (EC FP7, GA 226701) and SNSF project PDFMP3_132562/1.